These one-of-a-kind puzzles will greatly enhance your botany curriculum. In the seed puzzle children can see and feel the embryonic parts of the plant quite clearly. 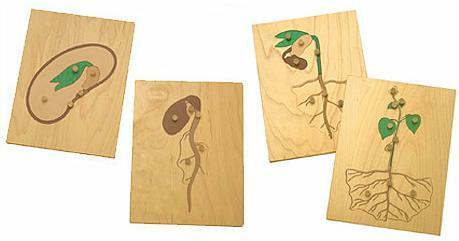 The subsequent three puzzles trace the process of plant development from sprouting to maturity. Our puzzles are precision cut and beautifully crafted, with the natural wood background complementing the realistic colors of the pieces. An informative control sheet comes with each puzzle and names the parts of the seed and plants. 7½" x 10".